Getting straighter teeth doesn’t have to involve bulky brackets or stabbing wires. At Russel Anderson Jr. Dentistry, we provide an orthodontic treatment that can comfortably align your teeth. Introducing Invisalign invisible braces, created to give you the smile of your dreams without any of the discomfort! 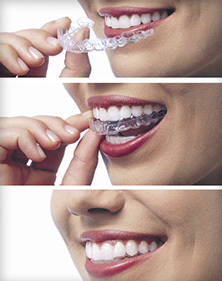 Invisalign is a recent advancement in orthodontics that consists of a series of customized aligners. These clear plastic trays function to straighten your teeth by gently shifting the teeth into place. Clear and virtually undetectable. No one should have to know you’re wearing braces! Customized for your mouth to give you the best results possible. Your custom-designed aligners will also increase your comfort throughout the process. Removable. You can brush and floss normally, and you don’t have to change your diet to wear Invisalign. Free from unsightly brackets and wires. Not only is Invisalign attractive, but it is also smooth and painless. Dr. Anderson will begin with a general examination of your teeth. He will then discuss treatment options with you, asking you what your desired aesthetics are and your preferences regarding your orthodontic treatments. As you work with Dr. Anderson, he will help you design a detailed treatment plan that will end in a vastly improved smile. Once your consultation is over, Dr. Anderson will take impressions of your teeth. The impressions are then sent to the lab, where they will custom design your series of aligners. Dr. Anderson will monitor your progress from start to finish, with regular appointments just every six to eight weeks. Many of our patients achieve a straighter, more even smile in less than one year wearing Invisalign. At Russel Anderson Jr. Dentistry, we offer a family-oriented, compassionate atmosphere where you can design the smile of your dreams. We hope to meet with you soon to discuss your needs and goals. For more information on Invisalign, call our office today! FREE Teeth Whitening upon completion of full Invisalign treatment Call 770-419-2535 today to schedule. Kennesaw dentist Dr. Russell Anderson has been providing exceptional cosmetic dentistry, dental implants, Invisalign clear braces, general dentistry and so much more for more than 20 years to patients in the northern Marietta, Georgia suburbs, including the communities of Kennesaw, Acworth, Shiloh West, Noonday and Woodstock, GA and zip codes 30066, 30144 and 30152.